The HeartMath Institute (HMI) provides a low-cost heart rate variability analysis service to certain clinics. The AAR, or autonomic assessment report, quantifies 24 hours of HRV data. This service is available to health-care, research and wellness professionals. In most cases, the analysis and completed report is available within 48 hours. Clinical studies and other research have established that heart rate variably can be an effective measure for health assessments. HRV analysis is easy to use and noninvasive. 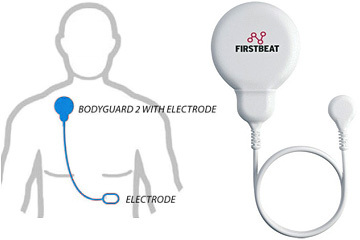 HMI uses the Firstbeat BodyGuard2 HRV recorder, a device that makes it easy to collect HRV data, weighs less than an ounce and is less than 2 inches in diameter. We have spent many years investigating how various clinical disorders, as well as healthy and optimal function are reflected in autonomic nervous system function as assessed by HRV analysis. HRV assessment can validate the effect of various interventions on autonomic function, including pharmacological, conventional or complementary interventions. Additionally, HRV services enable HMI researchers to more fully characterize autonomic dynamics in a wide range of populations and clinical challenges and conditions. The AAR is comprehensive: It includes time domain, frequency domain and circadian-rhythm analysis, all of which are quantitatively reported and graphically displayed. These can provide physicians with clinically relevant information about autonomic activity and function. View a sample AAR, and learn more about HRV science and analysis. Learn more about the HRV Services and Price List. For more information or ordering, e-mail HeartMath Institute research assistant Jackie Waterman, M.T. at jwaterman@heartmath.org.